BRAZZAVILLE, Republic of Congo, November 30, 2018 (ENS) – Four poachers responsible for killing elephants on the edge of the Nouabalé-Ndoki National Park were sentenced to five years’ imprisonment by the local district court on November 22, according to the Wildlife Conservation Society, which conducts conservation work in the area. Leonard Beckou, Levi Bonaventure Lognangue, Bienvenu Nsimbizoina, all from the Democratic Republic of Congo, and Farvin Abegou, from the Republic of Congo, were each given the highest sentences for wildlife crime in Congo – five years in jail and a fine of five million Central African francs (US$10,000). In an unprecedented ruling the judge also declared that the four convicts would be transferred south to serve their sentences in Brazzaville, far away from the northern poaching networks. All of the other wildlife crime cases brought before the district court the same day also were handed the maximum penalty. Leonard Beckou, the gang leader, is a repeat wildlife crime offender, having been arrested twice before in 2015 and 2016. His latest poaching raids were conducted close to local villages, creating fear within local communities and demonstrating the negative impact of elephant poaching and the ivory trade not only on elephants, but also on people. In late October, as the full moon lit up the Ndoki forest, Beckou and his poaching team set up camp. They had been hunting for days, slaying four elephants while crossing forests to the south of the Nouabalé-Ndoki National Park. They were dissatisfied; the tusks were too small to cover the costs of the hunt and to compensate the risks of such a daring operation. Weary, they settled down next to the campfire, and discussed their plans to find a large tusker the following day. A hunting rifle hung from a branch close by, and a second large caliber weapon lay next to the leader, under a tarp. 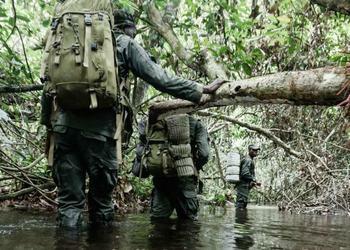 At midnight, undetected, a team of park rangers encircled Beckou’s camp. Their poaching exploits had attracted the attention of several Park research camps and a local community – four reports of large caliber gunshots had been registered at the Park headquarters. These alerts sparked a joint operation with the local Congolese Armed Forces and police, and over the course of three days, Beckou’s gang was pursued by some of the park’s tracking specialists. As the rangers brought the poachers into the park’s headquarters for questioning, dozens of community members followed the convoy singing and chanting, saluting the rangers for arresting these poachers and for securing their lands and forest. The men that Beckou recruited to accompany him into the forest were all first time offenders. Suffering financial and social difficulties, these young men were vulnerable to Beckou’s illicit proposition. Tonight, ranger teams will sleep out in the forest while carrying out their mission to protect their country’s natural heritage, in the knowledge that well-armed poaching gangs are willing to do whatever it takes to get their hands on ivory. 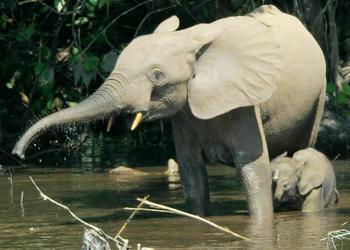 The African forest elephant, Loxodonta cyclotis, is found only in the Congo Basin. From an estimated population of over two million before the colonization of Africa, the population in 2015 was estimated to be about 100,000 forest elephants, most living in the forests of Gabon, the west-central African nation that borders Republic of Congo. The arrest of Beckou and his gang follows several years of law enforcement investment, providing better training, equipment and coordination to men and women on the front lines. But this case demonstrates the changing threats that the area’s wildlife, and the people working to protect it, are facing. Over the past decade central Africa’s forest elephants have been devastated by an unprecedented wave of ivory poaching. Poaching gangs have become more organized, better connected and operate across national boundaries. Once a rarity, exchanges of gunfire between heavily armed poachers and the park’s rangers are becoming frequent. Six have been recorded this year alone. As the pace and proficiency of poaching in the area shows no sign of abating, the importance of ongoing investment in the park’s protection is essential. The ranger force must be able to protect themselves from attacks by those who want to exploit the rich biodiversity of the region, and must continue to strengthen ties with the communities that they serve. The Nouabale-Ndoki National Park, spanning 4,200 square kilometres of pristine lowland rainforest, is managed by the Nouabale-Ndoki Foundation, a public private partnership between the Congolese Government and the Wildlife Conservation Society’s Congo Program. Operating under the Nouabale-Ndoki Foundation, Nouabale-Ndoki’s law enforcement team works to help bring wildlife criminals to justice, with support from the U.S. Fish and Wildlife Service, the Bureau of International Narcotics and Law Enforcement Affairs of the U.S. Department of State, funding from the UK Government through the Illegal Wildlife Trade Challenge Fund, and the Elephant Crisis Fund – a joint initiative between Save The Elephants and the Wildlife Conservation Network, in partnership with the Leonardo DiCaprio Foundation. The nonprofit Wildlife Conservation Society saves wildlife and wild places worldwide through science, conservation action, education, and inspiring people to value nature. Wildlife Conservation Society, WCS, based at the Bronx Zoo, conducts its Global Conservation Program in nearly 60 nations and in all the world’s oceans and its five wildlife parks in New York City, visited by four million people every year. A WCS-led study of wildlife crime cases brought before Congo’s courts between 2008 and 2017 found an increase in maximum sentences for wildlife crime being delivered by the courts, which have proliferated in the past few years – showing a shift in the severity in which wildlife crime is now regarded in the Republic of Congo due to the efforts of both the government and NGO partners.